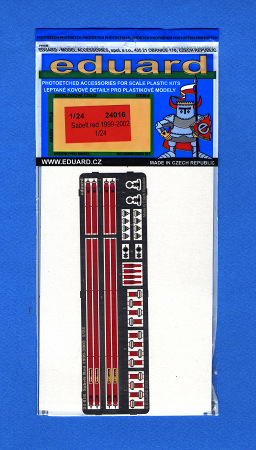 This new set of seatbelts from Eduard (item number 24 016) is for sports and competition cars circa 1999-2002. The single fret contains 36 pieces, 28 of which are prepainted. This fret contains enough parts to construct a pair of highly detailed belts. The length of the main belts allows you to accurately attach their ends to the rollcage of a typical race car interior. You can also shorten them to depict an aftermarket installation for a car without a rollcage. This pair of seatbelts will add useful and accurate detail to your next sports car project. I recommend this set and I would like to thank Eduard for providing the review sample.